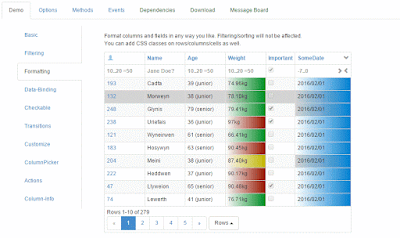 In this post, find a list of jQuery plugins to enhance your HTML tables. Using these plugins you can redesign your table, create a table from CSV or JSON, apply sorting and filtering the table content, freeze your table header row and create responsive tables. 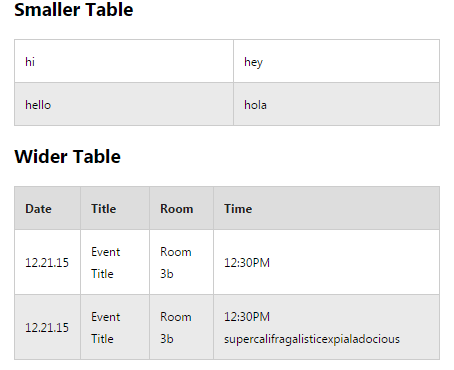 Tabulator is an easy to use table generation jQuery UI Plugin. 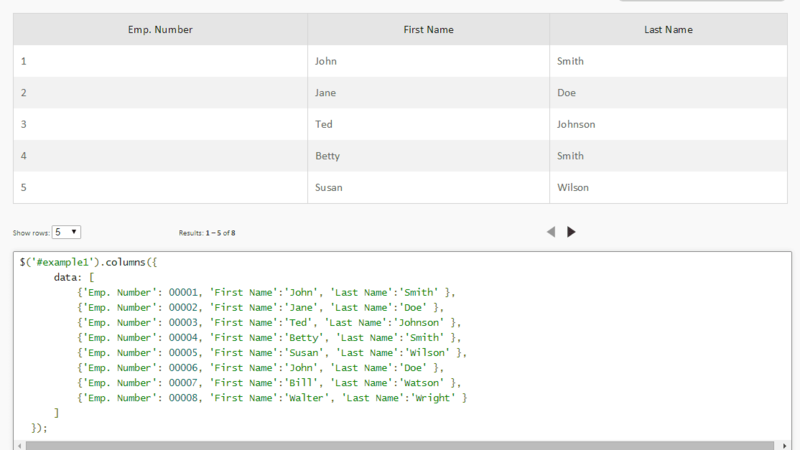 Tabulator allows you to create a table within seconds from any JSON formatted data. It is not dependent on any external CSS or images, simply include the library in your jQuery UI project and you're away! 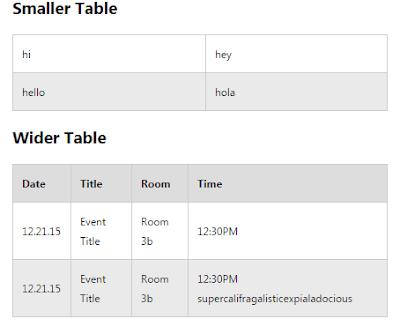 KingTable is a jQuery plugin for administrative tables that are able to build themselves on the basis of their input data. It supports client and server side pagination, client and server side search, custom filters views, and an automatic menu to hide and reorder columns and support for custom tools. 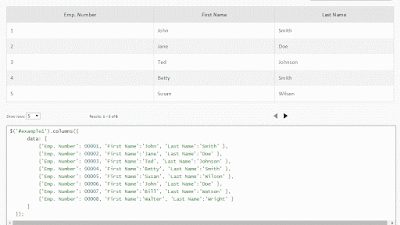 Client side export feature into: CSV, JSON, and XML formats. jQuery responsive table is a lightweight jQuery plugin that allows table markup to become fully responsive. It provides a clean list view via devices with small screens. It can work for multiple tables on a single page, as well as with tables that contain various combinations of merged cells. Best of all, it uses pure CSS for the rendering. csv2table is the jQuery plug-in that reads the CSV file, and generates an HTML table. StickySort is a jQuery plugin for adding sticky headers and columns to your tables, complete with an extended sorting function. jsGrid is a lightweight client-side data grid control based on jQuery. It supports basic grid operations like inserting, filtering, editing, deleting, paging and sorting. jsGrid is tuneable and allows to customize appearance and components. 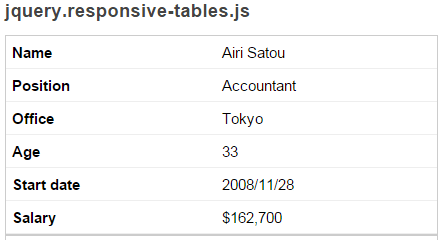 A 2kb jQuery solution for tables in responsive designs. A great way to deal with responsive tables is to reformat the related information cells into grouped blocks in mobile view. Freezeheader is a simple jQuery plugin to freeze the header row in html table. It's also known as fixed header table.